Energy efficiency increased to 98% from 92%. 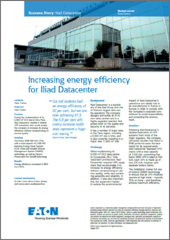 Iliad Datacenter is a subsidiary of the Iliad Group and one of France’s largest data centre operators. The company designs and builds all of its own data centres and is a highly regarded operator that prides itself on the quality and security of its services It has a number of major sites in the Paris region, including a 5,000 m2 site in Vitry, and is also currently investing in a major new 11,800 m2 site.